A trip on the Garden Route along the southern coastline of South Africa is the highlight of any trip to South Africa. The scenery includes mountains, valleys, dams, rivers, canyons, farmlands and much much more. In this article I will however concentrate on some of the activities that occur between Mossel Bay and Port Elizabeth. Over the years many rivers have cut through the escarpment and formed large canyons with sheer cliffs covered in trees and bush. The rivers flowing far below make a pretty picture as they wind their way through the hills on their way to the sea. For traffic to follow the Garden Route to the east it was necessary for mountain passes to be built down some of these canyons and up the other side. Of course these slowed traffic down and it was nigh impossible for the large trucks which form the backbone of trade in SA to negotiate them. When the roads were rebuilt some large bridges had to be constructed over these large canyons and many of them are quite spectacular. 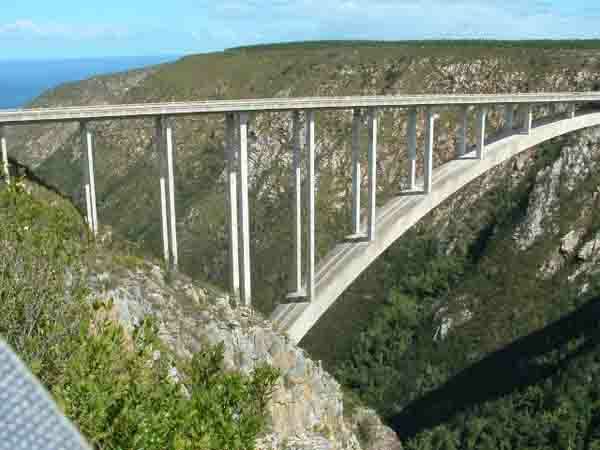 The Gouritz River just outside Mossel Bay is one of the rivers that required a really large bridge across its canyon. This bridge is 213 feet high and is built alongside the older bridge which is more or less the same height. As the old bridge was not removed when the new bridge was built it is still there today and is now utilised as the base for bungee jumping. At this bridge there are three types of jumps that are allowed. The first is the straight down bungee jump where you either dive off the bridge forwards or backwards and then free fall for a couple of seconds before the rope stops you from plummeting into the sandbanks of the river far below. The second jump allows you to swing out from the old bridge across the gulf between the two bridges in an arc that takes you under the new bridge. This jump also has an element of free fall in it and can be done singly or in tandem with someone else. Once you have completed the jump you are lowered to the river bed and then have to make your way back up a steep path to the top of the bridge. Sorry to say, you would not get me jumping off there if you paid me. My sons of course have more guts than Dad and have both done the jump when I was not with them. 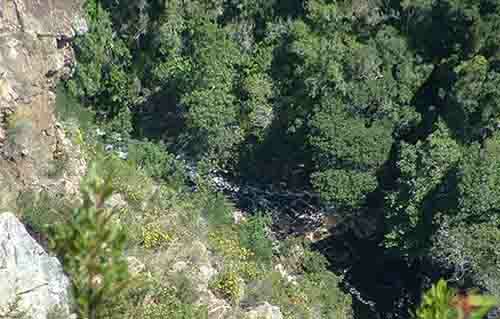 The Gouritz River jump is however the baby jump along the Garden Route. 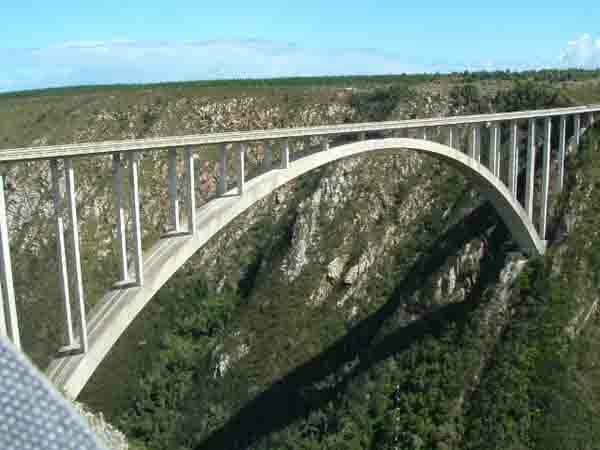 The Big Mama is the Bloukrans river bridge. To reach the top of this bridge one has to climb down the mountain side and then climb the arch of the bridge that stretches across the canyon and supports the struts holding up the road bridge. This can be very dangerous as there are sometimes strong winds blowing down the canyon and there are no handholds to keep you from falling off the edges. The operators appear to have set up some sort of harness system to ensure that no one falls off the bridge on their way the the launch site. Underneath the bridge is a narrow gorge with steep cliff faces on either side. They are covered in trees and bush. From the view point built high up on the side of one of the cliff faces one gets a good view of the bridge and anybody fool enough to want to jump off the bridge. The launching point is 708 feet (217 metres) above the river which flows directly under the bridge. 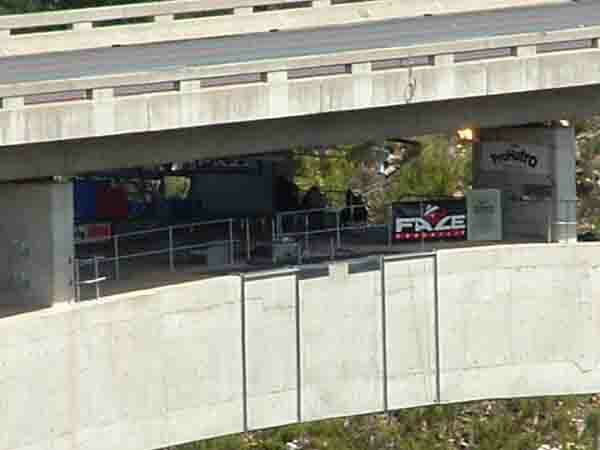 People jumping off this bridge must really want an adrenalin rush. The effort to get to the launch point and the climb back to the top after the jump will really test the nerve of the bravest jumper. Once at the launch point looking down all you can see are the cliffs on either side and the river far below. The fall away from the bridge is scary and the rebound into the air once you have reached the end of the rope must do wonders for the stomachs of those hanging onto the end of the rope. This jump is definitely not for the faint-hearted. You can call me all the names you like but you will never get me onto the end of one of these bungee ropes. For those brave enough to even think of jumping off this bridge I wish you luck. After this jump your life will never be the same again, yet some people come back and do it again and again. Are they stupid or just plain mad? I don't know!